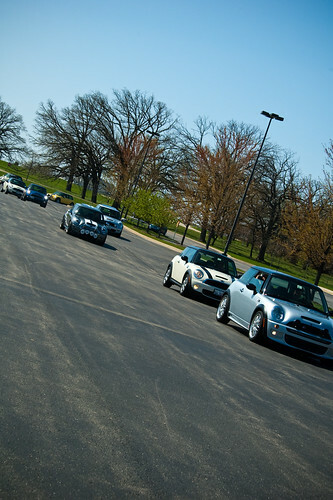 We will be joining forces with the Milwaukee MINIs and other area clubs for a fun group drive on some twisty Wisconsin back roads. We have moved our traditional early spring drive date back a little bit to Saturday April 16th to hopefully catch a bit of warmer weather. WRAPUP: Rain, cold, drizzle, and even a bit of snow.. Not the best of conditions, but we still attracted 25 or so MINIs (and one Honda Del Sol) from the Chicagoland and Milwaukee areas to cruise some fun back roads. The wet conditions made the turns a bit more challenging, and a good time was had by all. We then stopped off for a late lunch at the Bristol 45 Diner. Huge thanks again to the Milwaukee MINIs for joining us, Pat for the route planning, Cherissa for the lunch coordination, and the Bristol 45 Diner for being able to accommodate our crowd. Send links to photos to steve@chicagominiclub.com and we will add them here..
Update (04/07/2011) : If you are interested in getting a new Club Name Badge and having it personally delivered on the drive, send an e-mail to Steve@chicagominiclub.com .. They will need to be ordered shortly!! WHEN: Saturday April 16th. Departure is planned for 11am.WHERE: Chicago area start is at Ravens Glen Forest Preserves on Route 45 just south of Rt. 173. Ending destination is a late lunch in Bristol Wisconsin. 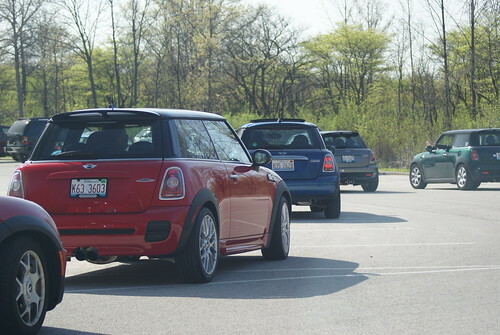 WHAT: Just a chance to hang out with fellow MINI (and possibly Mini) owners, explore some fun back roads, and enjoy a late lunch together. WHO: This event is open to MINI Club members and anyone potentially interested in joining the club. WHAT TO BRING: A full tank of gas, camera, optional FRS radio tuned to Channel 1, Subchannel 1, money for lunch, your favorite MINI clothing, and a smile!! Huge thanks to Pat for all the route planning, and to Cherissa for coordinating with the lunch stop!! Please add a comment to let us know you are attending so we can plan for enough route sheets and lunch space. I’ll be there like swimwear! My husband just got his 1st Mini a few months ago and we are interested in checking out the club. We’d love to join you and the other members for the Wisconsin Drive! I’m not a member yet, but I’m looking forward to meeting everyone on the 16th. I may be bringing a copilot as well. Can’t wait! John and Karen [ch1ckn] plan to be there, sounds like a fun day. Going to join club. Enjoyed drive last month. Will be there. Much thanks to Steve, Theresa and Jenny, we look forward to meeting you all next weekend. We will be arriving in the silver Camaro, but eager to see all the Minis. Glad you will be able to make it!! With me getting a new JCW, I’d love to attend since I haven’t gotten it out on the back roads yet. I guess it has been a while.. Congrats on the new one!! I’m in with my 11 year old co-pilot. Anyone in the West Chicago area or near by interested in meeting up and cruising together to the meeting spot? There will be 15 people (9 MINIS) from Wisconsin attending that RSVP’d to me and will be a part of the caravan from Milwaukee to Kenosha. Cheers! Won’t be able to make the drive. Happy Motoring! Won’t be able to make the drive. Bummer Rose. We’ll miss you, but hopefully see you at the next one..
Based on RSVPs and a few e-mails we are looking at around mid 30s including the Wisconsin Club who will be joining us part way. Catherine has to work, but Chic and I may join everyone. Something came up last night and we can’t make it. Looking forward to the next outing and hoping we can make that one. Hope everyone has a great day! Huge thanks to all. It was great to see and hang out with everyone. I had a fun time despite the cold and wet. Next year we will schedule better weather.